We’d love your help. Let us know what’s wrong with this preview of Sticker Girl Rules the School by Janet Tashjian. A Chipmunk Ballerina. A Treasure Chest Full of Jewels. A Zombie DJ. These are just a few of the many stickers ready to be peeled off Martina Rivera's new sticker sheet and come to life in Book 2 of the Sticker Girl series, Sticker Girl Rules the School. With a newfound confidenc Jump into Book 2 of this magical middle grade adventure series with Sticker Girl Martina Rivera! To ask other readers questions about Sticker Girl Rules the School, please sign up. Sticker Girl Rules The School is the 2nd book in the Sticker Girl series! This might have been a short read for myself but I found myself really enjoying the story of stickers coming to life! It's books like this one that made me wish that I had growing up. This has everything that a kid wants to read about, it has your typical adventure with problems along the way and who doesn't like the idea of stickers coming to life to either help with your problem or to cause problems! Even though this is t Sticker Girl Rules The School is the 2nd book in the Sticker Girl series! This might have been a short read for myself but I found myself really enjoying the story of stickers coming to life! It's books like this one that made me wish that I had growing up. This has everything that a kid wants to read about, it has your typical adventure with problems along the way and who doesn't like the idea of stickers coming to life to either help with your problem or to cause problems! Even though this is the second book in this series, you don't feel like you missed much of anything from the first book. The way that the main character was dealing with her problems, I think with having to deal with school, friends and family matters that kids will easily relate to Martina Rivera! It's the perfect chapter book for kids to read that will come with a sheet of stickers, that will provide hours of pure imagination and play time! Thank You to Janet Tashjian for writing a series that is totally fun and out of the box thinking for a series for younger readers!! Martina collects stickers and she’s discovered that when she peels them off they sometimes come alive! This is the second book in the Sticker Girl series, which is one that is sure to become a favorite of sticker loving girls. We learn that in the first book she and her best friend rode a Pegasus that jumped off the sheet. Now her sidekick, Craig who is a talking cupcake sticker is back and encourag Thanks to the @kidlitexchange network for the review copy of this book - all opinions are my own. Martina collects stickers and she’s discovered that when she peels them off they sometimes come alive! This is the second book in the Sticker Girl series, which is one that is sure to become a favorite of sticker loving girls. We learn that in the first book she and her best friend rode a Pegasus that jumped off the sheet. Now her sidekick, Craig who is a talking cupcake sticker is back and encouraging Martina to take some risks. He thinks she’d make a perfect class president, although the most popular boy in her class is sure to win. Luckily, the stickers she peels off one by one agree and are ready to help her take the big step! This book gives some good examples of friendship, taking risks and collaboration. And each book contains a list of stickers! Martina finds her shy self thrown into the world of holding rallies and giving speeches when she accidentally volunteered to run for class president. As expected, circumstances in her life took a turn for the worst before straightening up. I enjoyed the underlying theme of friendship, jealousy, believing in yourself and being brave. While I enjoyed the story overall, some parts felt like they were there just to fill time. At times it felt like some characters were being a little too much but I enjoyed watching the chaos the magic stickers caused because it made their ultimate purpose more meaningful. Thank you @kidlitexchange for providing me with a copy of this book to read and review. All opinions are my own. Meet Martina Rivera, also known as Sticker Girl. Martina has a pretty cool secret. Stickers magically come to life when she peels them off their sheet. She just has to decide when to use them to her advantage. The images on this sticker sheet include: a treasure chest, a palette of paint, a cell phone, a girl soccer player, a zombie DJ, a chipmunk ballerina, a pizza, a honeybee with a Thank you @kidlitexchange for providing me with a copy of this book to read and review. All opinions are my own. Meet Martina Rivera, also known as Sticker Girl. Martina has a pretty cool secret. Stickers magically come to life when she peels them off their sheet. She just has to decide when to use them to her advantage. The images on this sticker sheet include: a treasure chest, a palette of paint, a cell phone, a girl soccer player, a zombie DJ, a chipmunk ballerina, a pizza, a honeybee with a trumpet and a hot-air balloon. It also includes the cutest little sidekick, a talking cupcake named Craig!!! All of these stickers, along with her best friend Eve, are going to help Martina do something she’s absolutely terrified to do. Run for student council president. Along the way, they will create endless chaos, but also teach Sticker Girl some valuable lessons. This was a super cute early chapter book, especially for sticker fanatics. Martina is a wonderful main character. She’s a shy introvert who definitely has some anxiety stepping outside of her comfort zone. It was refreshing to see a character who is a constant worry wart too. I think many young readers will be able to identify with her personality. The idea of stickers coming to life is so creative and imaginative. My favorites were definitely DJ DK and the non gender conforming dancing squirrel. This was book two in the Sticker Girl series. I haven’t read the first book, yet. There were a few things mentioned from it, but I had no problem following along and reading this as a stand alone. A third book was set up at the tail too. With cute illustrations and a unique concept this would be a huge hit for second or third graders. Martina Rivera finds another sheet of stickers in her brother's things, and appropriate's them. She decides to activate the sticker of her friend, the cupcake, Craig, first. From there, she portions out the different stickers, from a cell phone (which ends up being lame) to the soccer playing Elaine who sticks around for quite a while. Various stickers help her with posters for the class election and the school dance. No major catastrophes occur, and the stickers don't have much lasting effect on Martina's existence, but she is slowly making new friends and finding her place at school. Weaknesses: I like Tashjian's work so much that I wish she would do more books like The Gospel According to Larry or For What It's Worth, which was quite a tour de force. I received an ARC of this book from the Kid Lit Exchange in exchange for my honest review. All opinions are my own. Sticker Girl Rules the school is about Martina Rivera, a girl with a very special secret. She can make stickers come to life. This means some of her best friends are a cupcake named Craig and a dancing chipmunk wearing a tutu. Each time her stickers come to life, the bring a little bit of trouble with them, and Martina must figure out how to pull things back together. I liked that de I received an ARC of this book from the Kid Lit Exchange in exchange for my honest review. All opinions are my own. I liked that despite the fact that this was a light, early chapter book, the author described Martina's shy introversion and some of her anxieties about being the center of attention. Sticker Girl is a chapter book series about Martina, a Hispanic girl who finds a magical sticker sheet. When peeled off, the stickers come to life – which may or may not be a good thing depending on who or what the sticker is, the sticker’s personality, and the situation. In this book in the series, we see Martina campaign for a place on the student council. Thanks to various stickers (including a talking cupcake and zombie D.J! ), she ends up being elected class president. As president, her duties include organizing an important class trip, a role which her shy personality isn’t comfortable with. To make matters worse, one of the stickers appears intent on becoming best friends with Bev, Martina’s closest friend. A delightful story of friendship, Martina ( Sticker Girl ) and Bev are best friends, they share tons of fun and adventure sharing enchanted stickers tat come to life when peeled off the page.Martina has a dog named Lily, and Cupcake Boy a sticker friend ( named Craig ) is afraid Lily or Martina's little brother might eat him for a snack. He is also afraid of Zombie Boy another sticker friend of Martina's. Martina wonders if Bev is truly her best friend or if she just hangs around for rides on Pe A delightful story of friendship, Martina ( Sticker Girl ) and Bev are best friends, they share tons of fun and adventure sharing enchanted stickers tat come to life when peeled off the page.Martina has a dog named Lily, and Cupcake Boy a sticker friend ( named Craig ) is afraid Lily or Martina's little brother might eat him for a snack. He is also afraid of Zombie Boy another sticker friend of Martina's. Martina wonders if Bev is truly her best friend or if she just hangs around for rides on Pegasus sticker? They have a treasure chest full of jewels and wish to help their financially struggling parents, but How? I thought this story was adorable, and imaginative, I think most kids would love it. Very good boook!! Love how the stickers come to life and help Martina Rivera come out of her shell more. This is delightful for any girl child with a reading skill of second or third grade. While it does have some big words the Author did make it easy i feel for children with those reading levels to read the book. This would also be a great book to read as a bedtime story to a smaller child! While it had some wacky things in it, The author made sure to address a few issues children tend to have. Very good boook!! Love how the stickers come to life and help Martina Rivera come out of her shell more. This is delightful for any girl child with a reading skill of second or third grade. While it does have some big words the Author did make it easy i feel for children with those reading levels to read the book. This would also be a great book to read as a bedtime story to a smaller child! While it had some wacky things in it, The author made sure to address a few issues children tend to have. I love how things are solved and how imaginative this is. While I did not read the first installment of this series I don't think I missed out jumping to book two. I was able to get involved with the story almost right away. Thanks to the Kid Lit Exchange network for the review copy of this book - all opinions are my own. This is the second book in a series about Martina, a shy girl who has magical stickers that come to life and help her solve problems in fun and creative ways! Themes of friendship and family along with a good dose of suspense and humor make this a great choice for middle grade chapter book collections. that should really appeal to girls in the 8-10 year old range. Really cute, and a great idea for a book! The stickers make it more interesting for a kid, and as Sticker Girl said, each one has something to teach you! Note: I received this book for free through Goodreads Giveaways. Our homeschool really enjoyed this book. We look forward to getting more books from this author in the near future. The author has an awesome writing style and for those of you that purchase the print book you get a free sticker sheet which is so cool! I chose this book because I loved stickers and had a huge collection as a child. So this worked perfect for mommy! 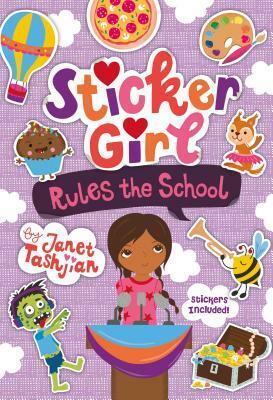 Today, I'm featuring the adorable, fun-filled and heartwarming Sticker Girl Rules the School by Janet Tashjian. Scroll on down to find out more about the book, my review, and enter for a chance to win your own copy! I was always collecting stickers growing up and was terrified of using them for fear of wasting them. Parental Figures did not understand and argued having them and not using them was a waste of money. I am the proud mom of a 10 year and I still do not understand that logic. :D Of co Today, I'm featuring the adorable, fun-filled and heartwarming Sticker Girl Rules the School by Janet Tashjian. Scroll on down to find out more about the book, my review, and enter for a chance to win your own copy! I am the proud mom of a 10 year and I still do not understand that logic. :D Of course, my daughter is the type to just put stickers anywhere, lol! So of course I couldn't resist a book where stickers come to life, let alone an anxious sticker girl running for student council. I couldn't imagine doing something like that, ever. I wish more books like this were around when I was a kid. Stickers are great and all, but having a shy introvert with anxiety as a protagonist, especially so young is amazing. I would've understood myself and how I wasn't broken much earlier if I had this book then. It's very clear how Martina likes people and doing things, but has to recharge afterwards. And how worrying is natural for her and she doesn't understand how people DON'T worry all the time. She tries and her family tries and she's working on her confidence (the shyness) but still being herself (the introvert). Loved the scenes with the treasure box full of jewels. My heart leapt and dropped along with the girls. I'm pretty sure the squirrel ballerina is my favorite sticker, though the zombie DJ became a close second. Yay for not enforcing gender norms and sexism! Janet Tashjian is a middle-grade and young adult novelist who’s been writing books for children for fifteen years. Her first novel Tru Confessions was made into a critically acclaimed Disney TV movie starring Clara Bryant and Shia LaBeouf. The Gospel According to Larry is a cult favorite and Fault Line is taught in many middle and high schools. Her novels My Life As a Book, My Life As a Stuntboy, Janet Tashjian is a middle-grade and young adult novelist who’s been writing books for children for fifteen years. Her first novel Tru Confessions was made into a critically acclaimed Disney TV movie starring Clara Bryant and Shia LaBeouf. The Gospel According to Larry is a cult favorite and Fault Line is taught in many middle and high schools. Her novels My Life As a Book, My Life As a Stuntboy, and My Life As a Cartoonist are all illustrated by her teenage son, Jake. Their collaboration continues with Einstein the Class Hamster coming in August.